"Gallaudet" redirects here. For other uses, see Gallaudet (disambiguation). 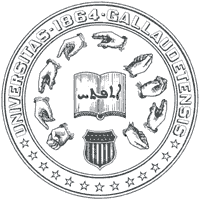 Gallaudet University[lower-alpha 1] /ˌɡæləˈdɛt/ is a federally-chartered private university for the education of the Deaf and hard of hearing located in Washington, D.C., on a 99 acres (0.40 km2) campus. Founded in 1864, Gallaudet University was originally a grammar school for both deaf and blind children. It was the first school for the advanced education of the deaf and hard of hearing in the world and remains the only higher education institution in which all programs and services are specifically designed to accommodate deaf and hard of hearing students. Hearing students are admitted to the graduate school and a small number are also admitted as undergraduates each year. The university was named after Thomas Hopkins Gallaudet, a notable figure in the advancement of deaf education, who was hard of hearing. Gallaudet University is officially bilingual, with American Sign Language (commonly abbreviated ASL) and English used for instruction and by the college community. Although there are no specific ASL proficiency requirements for undergraduate admission, many graduate programs require varying degrees of knowledge of the language as a prerequisite. In 1856, philanthropist and former United States Postmaster General Amos Kendall became aware of several deaf and blind children in Washington, D.C., who were not receiving proper care. Kendall had the courts declare the children to be his wards and donated 2 acres (8,100 m2) of his land to establish housing and a school for them. Edward Miner Gallaudet was the first superintendent of the new school. Later, John Carlin suggested placing a monument of Thomas Hopkins Gallaudet with Alice Cogswell. In 1857, the 34th Congress passed H.R. 806, which chartered the grammar school as the Columbia Institution for the Instruction of the Deaf and Dumb and the Blind and funded tuition costs for indigent deaf, dumb (mute), or blind children belonging to the District of Columbia. Seven years later, in 1864, the 38th Congress authorized the institution to grant and confirm college degrees. The collegiate department became known as the National Deaf-Mute College. The following year, in 1865, the 38th Congress removed the instruction that the institution was to educate the blind, and renamed it the Columbia Institution for the Instruction of the Deaf and Dumb. In 1954, Congress amended the charter of the institution, changing the corporate name to Gallaudet College, which had been the official name of the collegiate department since 1894. During his 17 years as Dean of the College in the 1950s and 1960s, George Ernst Detmold was a significant figure in helping the college achieve accreditation. He also led the college in developing new departments, especially drama. He directed Gallaudet theater productions, which eventually led to starting the National Theatre of the Deaf. In 1986, Congress again amended the charter of the Institution, renaming it Gallaudet University. The school was established in 1857 with considerable efforts being made by several concerned citizens of Washington, D.C. Two houses were used, one purchased and one rented. On November 1, 1858, the First Annual Report was submitted to the Secretary of the Interior. During the school's second full year of operation (1858–1859), 14 deaf students and 7 blind students were in attendance. Superintendent Gallaudet, anticipating the future growth of the school, requested money for more buildings, lamenting the fact that the money was not issued in the year prior, due to federal budget problems. The Second Annual Report was submitted November 5, 1859. During the third academic year (1859–1860), Kendall beseeched the federal government for funds to relocate the school to more spacious grounds. 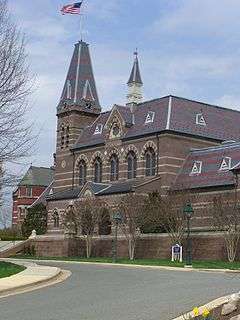 Gallaudet praised Kendall for donating money needed to construct a new brick building; however, both school buildings were already at capacity. There were 24 deaf students, necessitating a second teacher of the deaf. The teacher of the 6 blind students resigned due to health concerns. By the 1860–61 academic year, the Civil War had been in progress for over six months. Gallaudet reported that the students were safe and free from fear. There were 35 deaf students and 6 blind students in attendance during the academic year. An art teacher was hired for the first time. During 1861–62, new monies provided for industrial education were used to rent a nearby shop in order to teach cabinet-making to the male students. Plans were underway to construct a new building using $9,000 that Congress appropriated to the school. There were 35 deaf students and 6 blind students. During vacation in August a regiment of troops used the brick building for a hospital, and some of the students who stayed over the summer helped with tending to the sick soldiers. One soldier died. For the first time, Gallaudet proposed expanding the school to create a college for deaf students. Even with new construction completed for the 1862-1863 school year, the school was still at capacity and more money was needed to purchase 13 acres (53,000 m2) of adjoining land and then build even more buildings. Gallaudet asked for money to pipe in water from the river, as the existing cistern and well were inadequate to the school's needs. College-level classes were offered for the first time during the 1863-64 academic year. Congress provided approval for Columbia to grant college degrees, and an enabling act for the college was passed and approved by President Lincoln. An elaborate inauguration ceremony was held in June with Laurent Clerc in attendance. Fourteen acres of land was purchased with money supplied by the government. Gallaudet was promoted to the position of president of the institution. He continued to push for funds for expansion and new buildings. Gallaudet also proposed discontinuing services for blind students, saying that the small number of blind students would be better served at the school for the blind in Baltimore. The enrollment numbers increased rapidly during the 1864–65 academic year. Gallaudet asked the government for money to accomplish several projects, including the construction of an ice house and a gas house, sewer lines, and more. Major construction continued on campus. The name of the collegiate department was changed to "National Deaf-Mute College". The blind students were transferred to a school in Baltimore. During the 1865–66 academic year, Gallaudet responded to criticism from supporters of the oral method in Massachusetts, saying that oral instruction is usually of little value to congenitally deaf children. Gallaudet proposed that a representative of the school be sent to Europe to study the methods employed there, in order to determine which types of instructional methods might be added to those methods already being used successfully at the Columbia Institution and other American schools. Combined enrollment of all levels of instruction, including the collegiate level, exceeded 100 for the first time during this year. There were 25 students enrolled in the college, including students from 14 states of all parts of the Union. Edward Allen Fay joined the faculty as a professor of history, having learned to sign as a child. In the 1866–67 academic year, the building for the primary school was extended and sickness was thereby reduced. A mathematics professor was hired for the first time. More money was needed to accommodate additional students expected to swell the ranks of the school. Gallaudet gave a lengthy account of his travels to Europe and was very critical of the extent to which speech is taught to deaf children in European schools for the deaf. Nevertheless, he recommended that a limited amount of speech training be afforded to deaf students in America to those who show they can benefit. His travels took him to: Doncaster, England; Birmingham, England; Manchester, England; Liverpool, England; Glasgow, Scotland; Belfast, Ireland (Belfast, Northern Ireland); Dublin, Ireland; Geneva, Switzerland; Nancy, France, Saint-Hippolyte-du-Fort, France; Vienna, Austria; Leipsic, Saxony (Leipzig, Germany); Lubec (Lübeck, Germany); Frankfort On-the-Main (Frankfurt, Germany); Brussels, Belgium; Zurich, Switzerland; Rotterdam, Netherlands; Paris, France; Weissenfels, Prussia (Weißenfels, Germany); Prague, Bohemia; (Prague, Czech Republic); Berlin, Prussia (Berlin, Germany); Milan, Italy; Genoa, Italy; Turin, Italy; Dresden, Saxony (Dresden, Germany); London, England; Edinburgh, Scotland; Bordeaux, France; Marseilles, France; Munich, Bavaria (Munich, Germany); Bruges, Belgium; St. Petersburg, Russia; Åbo, Finland (Turku, Finland); Stockholm, Sweden; and Copenhagen, Denmark. The biggest educational conference in the then-history of deaf education was held during the month of May 1868 in Washington, D.C., largely made up of principals of schools for the deaf. Fourteen schools for the deaf were represented from 22 different states. The chief topic of discussion was the recommendations put forth by Edward Gallaudet regarding adding articulation lessons to schools' curricula. In 1868–69, the first students completed a full course of college studies, all graduating with bachelor's degrees. The founder of the school, Amos Kendall, died in November 1869. Gallaudet delivered a eulogy at the board meeting in January 1870. The main central building was partially completed, with rooms in the basement and on the first floor first being used. Plans were being made to purchase Amos Kendall's estate, which adjoined the grounds of the school. Gallaudet cautioned Congress that Kendall's heirs had plans to subdivide the property if it was not sold to Columbia, and hence the land would never again become available for purchase as a whole. In 1881, Laura Sheridan, a hearing woman, inquired about Gallaudet University's accepting women. She was told that deaf women could not enter the institution. In 1887 Gallaudet agreed to allow women to apply with the intent that women would not stay. Temporary living arrangements were made and the college remained co-educational. Student strikes at Gallaudet University starting March 6, 1988, revolutionized the perception and education of Deaf culture. Deaf students were outraged at the selection of another hearing president, Elisabeth Zinser; the university had never selected a deaf person for this position. Alumni, faculty, staff, and students demanded that the next president of the university be deaf. After a week of protest and activism, Zinser resigned and was replaced by I. King Jordan. This movement became known as Deaf President Now (DPN). Jordan announced his retirement in September 2005. On May 1, 2006, the University's Board of Trustees announced that Jane Fernandes, the University's current provost, would be the University's next president. This was met with protests from the student body, both in person on campus and in internet blogs and forums. Initially, students cited the lack of racial diversity among finalists, Fernandes's lack of warmth, and her lack of fluency in American Sign Language. Jordan publicly accused some critics of rejecting Fernandes because "she is not deaf enough." He described the protest as "identity politics", saying, "We are squabbling about what it means to be deaf." The Washington Post reported that Fernandes "would like to see the institution become more inclusive of people who might not have grown up using sign language," stating that Gallaudet must embrace "all kinds of deaf people." Those who opposed her said that they feared a "weakening of American Sign Language at an institution that should be its standard-bearer." Protesters said Fernandes distorted their arguments and that the protest centered on her inability to lead, an unfair selection process and longstanding problems at the school. In the spring 2006 protest, students blocked entrances to the Gallaudet campus, held rallies, and set up tents near the University's main entrance. Fernandes, appointed to serve as president-designate until Jordan retired, said that she would not step down. On May 8, the faculty gave a vote of no confidence for Fernandes. When the fall 2006 academic year resumed, some students, faculty, staff, and alumni continued their protest, calling for Fernandes to step down and for the presidential search to be done again. On October 11, a group of protesting students shut down the campus. On October 16 at a regularly scheduled meeting, faculty members voted 138 to 24 to block Fernandes from becoming president of Gallaudet University. Fernandes said, "I really don't understand so I have to believe it's not about me. ... I believe it's about evolution and change and growth in the deaf community." On October 29, the university withdrew the appointment of Fernandes. In an opinion piece in The Washington Post, Jordan defended Fernandes's remarks and denounced the board's decision and the actions of the protesters, saying, "I am convinced that the board made a serious error in acceding to the demands of the protesters by terminating Fernandes's presidency before it began." On December 10, 2006, the Board of Trustees announced that Robert Davila would serve as interim president for a period of up to two years. He was formally installed on May 9, 2007, during a ceremony that included a speech by D.C. Congressional Delegate Eleanor Holmes Norton, who spoke positively of the 2006 protest. He stepped down on December 31, 2009. On June 29, 2007, in the aftermath of the controversy over the university's presidency, Gallaudet was temporarily placed on probation by its accreditation organization, the Commission on Higher Education of the Middle States Association of Colleges and Schools. It was also reported that in 2006, the Office of Management and Budget had found that "Gallaudet failed to meet its goals or showed declining performance in key areas, including the number of students who stay in school, graduate and either pursue graduate degrees or find jobs upon graduation." In January 2007, former president Jordan wrote an editorial on the topic that appeared in the Washington Post. 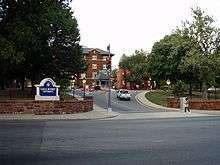 The Middle States Commission later reaffirmed Gallaudet's accreditation on June 27, 2008. On October 18, 2009, the Board of Trustees announced that Gallaudet's tenth president would be T. Alan Hurwitz. He began his tenure on January 1, 2010. Congress incorporated the Columbia Institution in 1857, significantly amended its charter in 1954, and authorized permanent congressional appropriations. In 1986, Congress passed the Education of the Deaf Act and amended it in 1992. These Congressional acts are part of "the supreme law of Gallaudet University." Gallaudet must obtain authorization from the Secretary of the US Department of Education in order to sell or transfer title of any of its real property. The diplomas of all Gallaudet graduates are signed by the current U.S. President, which dates from President U.S. Grant signing students' diplomas in 1872. Three members of Congress are appointed to the university's Board of Trustees as "Public Members." Gallaudet must provide annual reports to the Secretary of Education. "Gallaudet receives the bulk of its income in the form of an annual appropriation from Congress, and the Department of Education oversees the University's appropriation for the Federal government." Gallaudet University (and the National Technical Institute for the Deaf) are authorized to make purchases through the General Services Administration. Gallaudet's Fifty-Fifth Annual Report contains an appendix that includes the text of 99 Federal Acts related to Gallaudet/Columbia which were enacted between 1857 and 1912. President Ulysses S. Grant, 1870 and 1871. President Rutherford B. Hayes, 1877, 1878, 1879, and 1880. President James A. Garfield, 1881. President Chester A. Arthur, 1882. President Lyndon Baines Johnson, 1964 and 1966. Several programs and majors are offered at Gallaudet University. The five most popular majors are business, visual and performing arts, communication studies, physical education, and psychology. Gallaudet University offers thirty graduate programs in ten Departments as well as on-line and on-campus continuing education courses. Over 90 percent of the classes offered at Gallaudet University contain fewer than 20 students. The freshman retention rate at the university is relatively low, at 72 percent, and the four-year graduation rate is also low, at 16 percent. National Historic Landmarks designation (added 1965). Historic American Buildings Survey (added 1933). The campus is also shared with Kendall Demonstration Elementary School, a day school serving deaf and hard of hearing students from birth through grade 8,  and the Model Secondary School for the Deaf, a day and residential high school for deaf and hard of hearing students. In October 2014, the Gallaudet University board of trustees announced a 10-year, $450 million development of its campus along 6th Street NE. The development, which includes both campus property as well as college-owned residential and retail property across the street, will be overseen by The JBG Cos.
Gallaudet is a member of NCAA Division III and the North Eastern Athletic Conference. The teams that play in the North Eastern Athletic Conference are the men's and women's basketball, cross country, soccer teams, along with the baseball, softball, and volleyball teams. However, the Gallaudet football team plays in the Eastern Collegiate Football Conference. In addition to the football team, which plays in a different conference than most sports at Gallaudet, the men's and women's swimming teams, as well as the men's and women's track and field teams, compete as independents. The Bison compete in baseball, basketball, cross country running, football, indoor and outdoor track and field, soccer, softball, swimming, tennis, volleyball, and wrestling. Their colors are buff and blue, which were chosen after Union soldiers' uniforms in the Civil War. Gallaudet women's basketball made its biggest splash in 1999, with a group of players from the Minnesota State Academy for the Deaf among those leading the way. Ronda Jo Miller, most certainly the greatest women's basketball player in the program's history, was a three-time Division III All-America selection, as well as one of the top women's volleyball players. Under the leadership of coach Kitty Baldridge, Miller, Touria Ouahid, Ronda Johnson and Jenny Cooper led the Bison to the NCAA Tournament for the second time in three seasons. Receiving one of the lowest seeds as an at-large team into the Division III NCAA Tournament field, which numbered just 48 teams, the Bison traveled to St. Mary's College (Md. ), the school which had just defeated them in the Capital Athletic Conference tournament, and came away with an 80-73 win. In the second round, Gallaudet faced a team from The College of New Jersey which had received a first-round bye and was highly favored, but Miller poured in 38 points, using a variety of impressive shots. The Bison advanced to the Sweet 16 round of the 1999 tournament before falling to host school Salem State College (Mass.). Miller finished with 2,656 points scored, 1,545 rebounds and 373 blocked shots, and was called "one of the best basketball players in Division III history" by the NCAA. Kevin Cook coached the team briefly to success. The team had not won a conference game in five years and even lost a game by 75 points in Cook's first year in charge. Cook's persistence on defense and discipline turned the program around. Gallaudet began the 2010–11 season on a 20-game winning streak and finished the season 24–4 (20–2 in conference play). Cook was named North Eastern Athletic Conference Coach of the Year, and senior Easter Faafiti was voted NEAC Player of the Year. The 2010–11 season ended in the first round of the Division III NCAA Championships with a loss to Juniata. After a victory over Penn State-Berks in the 2010–11 season, Penn State guard Corin Bishop "said that she views the Gallaudet team as a great basketball team, not a team of deaf players." Hayes of Gallaudet later said, "I feel like there are people who stereotype us as deaf players, I'm just like everyone else who plays basketball". In an interview with Lydia Lum of Diverse, he said, "Because of us, there's a growing awareness that there are differences between deaf people, but we're all the same." The football huddle originated at Gallaudet when the team noticed that their opponents were trying to see and read their signs in order to try to guess their plays. After an undefeated season in 2005, which was achieved after 122 years, head coach Ed Hottle began his campaign to return Gallaudet to the NCAA ranks. With support from the Gallaudet administration, the Bison played their last season of club football in 2006 and played a full NCAA slate of eight games in 2007. After the 2009 football season, Coach Hottle left to become the first head coach of the first football team at Stevenson University. He announced his decision in a heart-felt meeting with the football team. Offensive Coordinator Chuck Goldstein was tapped to be the interim head coach of the football team. On December 17, 2009, the interim tag was removed and he is now the permanent head coach of the team. Gallaudet University's football team has a longstanding rivalry with Catholic University of America, another school in the Washington D.C. area. On September 7, 2012, Gallaudet University defeated Catholic University of America for the first time in the 106-year history of the rivalry between the two D.C. schools. In the fall of 2013, Gallaudet's football program began a remarkable run for the Division III playoffs and garnering a considerable amount of publicity, winning the regular season with a 9-1 record, before falling to Hobart College in the first round of the playoffs and ending the season with a 9-2 (.818) overall record. In 2006, the Gallaudet women's volleyball team ended their season 30–10 after a history-making run to the Sweet Sixteen in the NCAA Division III tournament. Tamijo Foronda, a senior outside hitter, was named to the AVCA All-American Team. Tony Tatum, All-American Cornerback from 2009-2012, became the first football player in Gallaudet University to play professionally. Signed to AFL's Utah Blaze and posted 3 interceptions, one returned for a touchdown. Currently signed to the Cleveland Gladiator. The campus Greek community is relatively small with only 4 fraternities and 4 sororities. The four fraternities are Kappa Kappa Gamma, Alpha Sigma Pi, Kappa Sigma, and Delta Sigma Phi. The sororities are Phi Kappa Zeta, Delta Epsilon, Alpha Sigma Theta, and Delta Zeta. The Gallaudet Research Institute (often abbreviated GRI) is internationally recognized for its leadership in deafness-related research. GRI researchers gather and analyze data concerning the social, academic, and perceptual characteristics of deaf and hard of hearing populations, primarily to provide information needed by educators in the field. Staff are skilled in various research methodologies including surveys, test norming and assessment, ethnographic studies, clinical studies, and information management. Gallaudet publishes three journals. Sign Language Studies has been published since 1972. Recently, the university launched the Deaf Studies Digital Journal, the first peer-reviewed academic and creative arts journal in American Sign Language and English. Also, Gallaudet University Press publishes American Annals of the Deaf, "the oldest and most widely read English-language journal dealing with deafness and the education of deaf persons". ↑ "Columbia Institution for the Deaf" was the corporate name for what is now Gallaudet University. In 1954 a law was passed, changing the corporate name to "Gallaudet College." (The collegiate department of the Columbia Institution had gone by the name "Gallaudet College" since 1894.) In 1986, another law was passed changing the name to "Gallaudet University." ↑ Current as of June 30, 2009. "U.S. and Canadian Institutions Listed by Fiscal Year 2009 Endowment Market Value and Percentage Change in Endowment Market Value from FY 2008 to FY 2009" (PDF). 2009 NACUBO-Commonfund Study of Endowments. National Association of College and University Business Officers. Retrieved March 8, 2010. ↑ Staff (2013). "Gallaudet University". U.S. News and World Report. Retrieved 18 February 2013. ↑ "History of Gallaudet University". Gallaudet University. Retrieved July 18, 2012. ↑ "John Carlin". Deafbiography.com. Retrieved February 10, 2012. ↑ "A Century of Lawmaking for a New Nation: U.S. Congressional Documents and Debates, 1774–1875". The Library of Congress. Retrieved July 18, 2012. ↑ "38th Congress: Session 1, Chapter 52" (PDF). Save Our Deaf Schools. Retrieved July 16, 2012. ↑ "Gallaudet College Hearing Before the Committee on Education and Labor" (PDF). 83rd Congress, Second Session. Save Our Deaf Schools. May 5, 1954. Retrieved July 16, 2012. 1 2 20 U.S.C. ch. 55, "EDUCATION OF THE DEAF"
↑ "First Annual Report" (PDF). Save Our Deaf Schools. 1 November 1858. Retrieved 18 July 2012. ↑ "Second Annual Report" (PDF). Save Our Deaf Schools. 5 November 1859. Retrieved 18 July 2012. ↑ "Third Annual Report" (PDF). Save Our Deaf Schools. 5 November 1860. Retrieved 18 July 2012. ↑ "Fourth Annual Report" (PDF). Save Our Deaf Schools. 5 November 1861. Retrieved 18 July 2012. ↑ "Fifth Annual Report" (PDF). Save Our Deaf Schools. 3 November 1862. Retrieved 18 July 2012. ↑ "Fifth Annual Report" (PDF). Save Our Deaf Schools. 15 October 1863. Retrieved 18 July 2012. ↑ "Seventh Annual Report" (PDF). Save Our Deaf Schools. 17 November 1864. Retrieved 18 July 2012. ↑ "Eight Annual Report" (PDF). Save Our Deaf Schools. 6 November 1865. Retrieved 18 July 2012. ↑ "Ninth Annual Report" (PDF). Save Our Deaf Schools. 6 November 1866. Retrieved 18 July 2012. ↑ "Tenth Annual Report" (PDF). Save Our Deaf Schools. 28 October 1867. Retrieved 18 July 2012. ↑ "Eleventh Annual Report" (PDF). Save Our Deaf Schools. 26 October 1868. Retrieved 18 July 2012. ↑ "Twelfth Annual Report" (PDF). Save Our Deaf Schools. 20 October 1869. Retrieved 18 July 2012. ↑ "Twelfth Annual Report" (PDF). Save Our Deaf Schools. 29 October 1870. Retrieved 18 July 2012. ↑ The Chronicle of Higher Education: "Student Protests Over Presidential Pick Return to Gallaudet U." ↑ The Washington Post: "Gallaudet Names New President." ↑ Fox News: "Is Gallaudet University's Dean 'Deaf Enough'?" ↑ The Washington Post: "Signs of Change At Gallaudet." ↑ The New York Times: "Protests Continue at University for Deaf." ↑ The Washington Post: "Source of Gallaudet Turmoil Is Up for Debate." ↑ The Washington Post: "Gallaudet Reopens With Protesters Still At Front Gates." ↑ Inside Gallaudet: "Board of Trustees votes to terminate Dr. Jane Fernandes appointment as president"
1 2 Jordan, I. King (January 22, 2007). "Deaf Culture and Gallaudet". The Washington Post. Retrieved May 3, 2010. ↑ "Speech by Congresswoman Eleanor Holmes Norton at the Installation of Gallaudet President Robert R. Davila" (PDF). Save Our Deaf Schools. May 9, 2007. Retrieved 16 July 2012. ↑ On Probation, Washington Post, July 14, 2007. ↑ "MSCHE Accreditation – Gallaudet University". Aaweb.gallaudet.edu. June 26, 2008. Retrieved February 10, 2012. ↑ "Janice Becker, Plaintiff vs. Gallaudet University, Defendant" (PDF). Save Our Deaf Schools. Retrieved 16 July 2012. ↑ "Profiles of Existing Government Corporations" (PDF). U.S. Government Accountability Office. Retrieved 16 July 2012. ↑ "A Growing College" (PDF). Gallaudet Protest. Retrieved 16 July 2012. ↑ History of the College for the Deaf, 1857–1907 – Edward Miner Gallaudet, Lance J. Fischer, David L. De Lorenzo – Google Boeken. Books.google.com. Retrieved February 10, 2012. ↑ "Columbia Institution for the Deaf and Dumb: 23rd Annual Report" (PDF). Save Our Deaf Schools. Retrieved 16 July 2012. ↑ Gallaudet, Edward M. "A History of the Columbia Institution For The Deaf and Dumb." (PDF). Save Our Deaf Schools. Retrieved 16 July 2012. ↑ "Address of Emeritus President E.M. Gallaudet" (PDF). Save Our Deaf Schools. May 6, 1914. Retrieved 16 July 2012. ↑ "Our heritage : Gallaudet College centennial (Book, 1964)". [WorldCat.org]. Retrieved July 16, 2012. ↑ "Lyndon B. Johnson: Remarks at the Gallaudet College Centennial Banquet". Presidency.ucsb.edu. June 6, 1964. Retrieved July 16, 2012. ↑ "Remarks at the Gallaudet University Commencement Ceremony". Weekly Compilation of Presidential Documents. 1994. 1 2 3 "Gallaudet University". US News & World Report. Retrieved 9 November 2014. ↑ "Gallaudet University". Pr.gallaudet.edu. October 3, 2008. Retrieved July 16, 2012. ↑ "National Register of Historical Places – DISTRICT OF COLUMBIA (DC), District of Columbia County". Nationalregisterofhistoricplaces.com. Retrieved July 16, 2012. ↑ "Gallaudet University". Nps.gov. Retrieved July 16, 2012. 1 2 "D.C. Inventory of Historic Sites" (PDF). District of Columbia. Retrieved 26 July 2012. ↑ "National Historic Landmarks Program (NHL)". Tps.cr.nps.gov. December 21, 1965. Retrieved July 16, 2012. ↑ "Prints & Photographs Online Catalog". Lcweb2.loc.gov. Retrieved July 16, 2012. ↑ Clabaugh, Jeff (October 10, 2014). "Gallaudet Selects JBG for Campus Development". Washington Business Journal. Retrieved October 13, 2014. 1 2 "Gallaudet Bison Athletics : Gallaudet University Joins North Eastern Athletic Conference". Gallaudetathletics.com. June 15, 2009. Retrieved July 16, 2012. ↑ "Beware the Thundering Herd". D3hoops.com. D3hoops.com. Retrieved 23 March 2015. ↑ "Embracing the silence". NCAA.org. NCAA.org. Retrieved 23 March 2015. 1 2 Donvan, John (February 3, 2011). "Gallaudet University Making Noise in Women's Basketball". ABC News. Retrieved 14 May 2013. ↑ "Parade magazine feature on Gallaudet University's women's basketball season". D3hoops.com. USA Today. Retrieved 14 May 2013. ↑ Lum, Lydia. "Gallaudet Women on the Road to Winner's Circle". Diverse Issues in Higher Education. Cox, Matthews and Assoc. Retrieved 14 May 2013. ↑ "The History of Gallaudet University (page 3)". Pr.gallaudet.edu. November 7, 1997. Retrieved July 16, 2012. ↑ Foster, Brooke (August 19, 2007). "Sound and the Fury". The Washington Post. Retrieved May 3, 2010. ↑ "Goldstein Named Gallaudet's 36th Head Football Coach, Davis Elevated to Assistant Coach". Gallaudet University. Retrieved 16 July 2012. ↑ "Gallaudet Defeats Catholic for the First Time in the School History". Gallaudet University Athletics. Retrieved 7 September 2012. ↑ "Women's Volleyball". Gallaudet University. Retrieved 16 July 2012. Wikimedia Commons has media related to Gallaudet University.